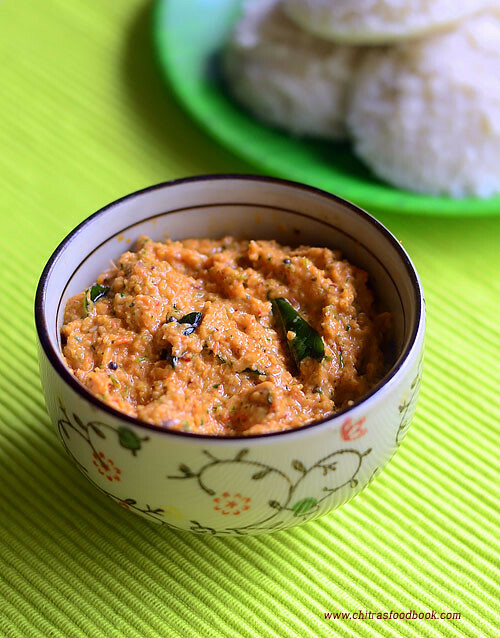 I came to know about this Kadamba chutney recipe from a reader’s request. I thought kadamba chutney and mixed vegetable chutney are one and the same. But then I realized Kadamba chutney is made with the combination of onion, tomato, coconut, ginger, garlic, chilli, urad dal, chana dal, mint+coriander+curry leaves. Its made without carrot, chow chow or any other vegetable.This morning, I prepared this chutney for our breakfast as a side dish for idli. I followed the recipe from Sangeetha’s blog. It was very nice and tasty. We all loved it very much. 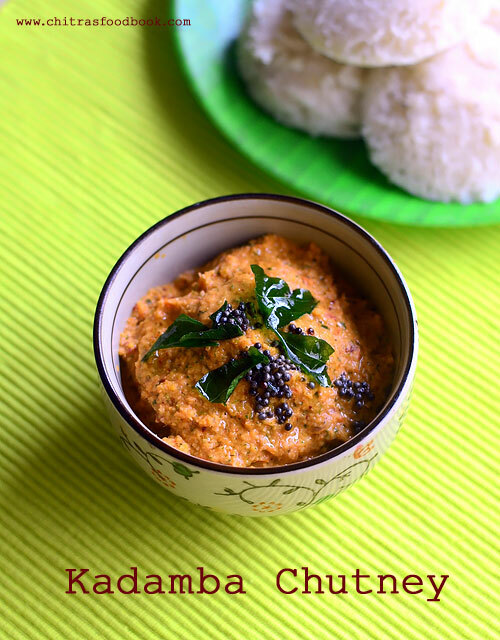 I felt this chutney recipe goes well with dosa, rava idli and even for mixed lentil dosa/ Adai. Do try this easy and yummy side dish recipe for your breakfast/dinner and let me know your views . Now lets see how to prepare this yummy South Indian style Kadamba chutney recipe for idli,dosa with step by step photo. Check out my collection of 48 Chutney Recipes ! Kadamba chutney - Side dish for idli, dosa and adai ! Wash and chop tomato, onion, green chilli.Peel ginger and garlic. Grate or finely chop the coconut. Set aside. In a kadai, heat oil and saute the urad dal + chana dal. When the dals start to turn golden, add the pinched red chilli and chopped green chilli. Saute for few seconds. Then add the chopped ginger, garlic, onion and saute for a minute. Lastly add the tomato and grated coconut along with the required salt and a small piece of tamarind. Saute until tomato turns mushy. Switch off the flame and add the mint+coriander+curry leaves. Saute quickly. They shrink and mixes well with the mixture. Let everything cool down completely. First grind them to a coarse paste without adding water. Then add water and grind to a thick paste. Remove the chutney to a serving bowl. Temper mustard seeds and curry leaves. Add to the chutney bowl and mix well. 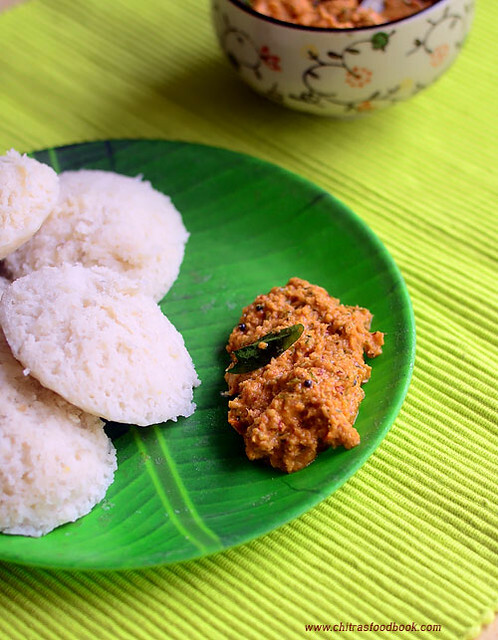 Serve with hot idli , dosa or adai ! Adding tamarind is optional but it gives a mild tangy taste to the chutney. Do not add more ginger. It will dominate the chutney flavor. No need to use more coconut. Its just for binding. You can skip it if you don’t want to use it. Yummy Kadamba chutney is ready to serve with Idli, dosa !! I too prepare this chutney but never knew it was called kadamba chutney :) Nice clicks..